With the increased demand for the development of wind energy, Tucker recognized there would be an increased need for hauling wind turbine related equipment. In 2002, Tucker opened his own wind transportation business, Indianapolis-based Modern Machinery Movers, which now employs more than 10 drivers. “I truly enjoy moving any large or difficult equipment, and that’s why I wanted to start this business,” said Tucker. “I also knew there would be a future in wind turbines, which would require special custom built tractors. Having been a former Western Star dealer, I knew this would be the manufacturer of choice." 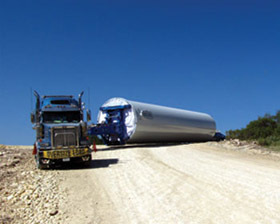 Commissioned to haul wind turbine towers across the United States for companies that include General Electric, Siemens, Westinghouse, Mitsubishi and Vestas, Tucker chose Western Star as his truck manufacturer of choice because he knew he would have complete control of the customization and specialized specs needed for this unique load. Tucker’s customized twin-steer tri-drive Western Star® 4900 SA, is a unique, five-axle tractor with a 515 hp Detroit Diesel® Series 60® engine, 40,000 pound front axles and 69,000 pound rears. The 13-axle steerable trailer features a double Schnabel unit that carries the wind towers. In addition to the twin-steer, Tucker also operates three Western Star tri-drive set-back 4900 SA tractors for heavy equipment. These trucks feature a 515 hp Series 60 engine, 18-speed Eaton transmission, four speed Spicer auxiliary transmission, 20,000 pound front axles and 69,000 pound rears. The Western Star 4900 SA stands up to any environment. Tucker’s tri-drive’s are the ultimate combination of performance and durability – critical to the heavy haul business – and Tucker gives the 4900 SA high marks for its increased payload opportunities. In addition, Tucker also notes that comfort and drivability surpass anything else on the road. The 4900 SA truck’s sloped hood makes for superior visibility through off-site terrain, and although all of his trucks are hauling massive machinery, Tucker also explains that the quiet ride can’t be matched.